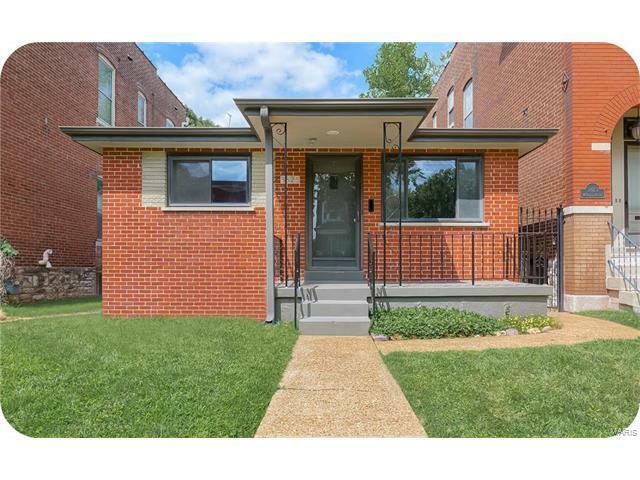 Nestled in Tower Grove Heights, this mid-century modern home is about as solid as they come! Beautiful original oak hardwood floors lay the foundation for the clean & simple design style that defines the architecture of this time period. Featuring a large living room/dining room combo & a light/bright eat-in kitchen w/brand new refrigerator & stove. The main level master suite features an attached full bath w/shower. Two more nice sized bedrooms & a vintage pink tiled full bath (groovy!) round out the main level. The lower level is partially finished & features an open area perfect as a family room/rec room, a kitchenette, laundry room, & a half bath. They sure knew how to make efficient use of space back then! Outside you'll find a fenced back yard & a two car garage. Other perks include a newer AC unit & a brand spankin' new roof on the house proper. Within walking distance to Tower Grove Park & the incredible restaurants & eclectic shops of South Grand. I-44 or I-40 to South Grand. Go south on South Grand to Utah. Right on Utah, left on Gustine, left on McDonald. Home is on the left.